The Hebridean Storyteller is inspired by the Western Isles of Scotland and aims to shine a light on the rich culture and heritage of these unique islands. 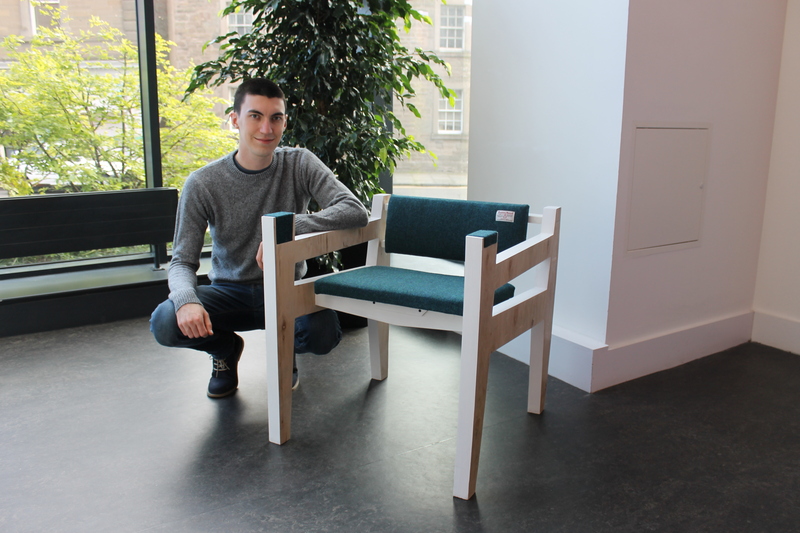 The chair uses technology to bring the stories of islanders to life, giving the user an insight into what life is like living on an island on the edge of a nation and a continent. It does this by first sensing the users presence with a pressure sensor embedded within the seat. This acts as a trigger that audibly plays a random story through speakers built into the arms of the chair. I hope that this project will help raise awareness of the islands and encourage people to want to explore them further. The actual design of the chair takes inspiration from the islands distinct characteristics – strong, resilient and dependable, yet warm and inviting. It is modern and contemporary but still holds tradition in its heart – the use of Harris Tweed in the upholstery is a symbol of the people of the island and their strong identity and livelihood. The Hebridean Storyteller will be exhibited and available for public use at the DJCAD Degree Show in Dundee from the 16th of May to the 25th of May, 2014 and again at the New Designers Expo in London at the Design Business Centre, Islington from the 2nd of July to the 5th of July, 2014.